I missed the chance to go anywhere Saturday through pure indulgence the night before; entirely self-inflicted. Not that I was too bothered as we have a good week ahead of us and I don’t want to over-indulge and get bored with the same old species. Sunday then for a trip to Bentley Wood with Sue to get a feel for the place late season. The drive over was rather pleasant with the gently undulating hills of North-West Hampshire leading into the picture-postcard charm of South Wiltshire. The changing colours and harvested fields brought home the realisation that these halcyon days are diminishing for another year with tall fronds of yellowing Fern lining the woodland rides. 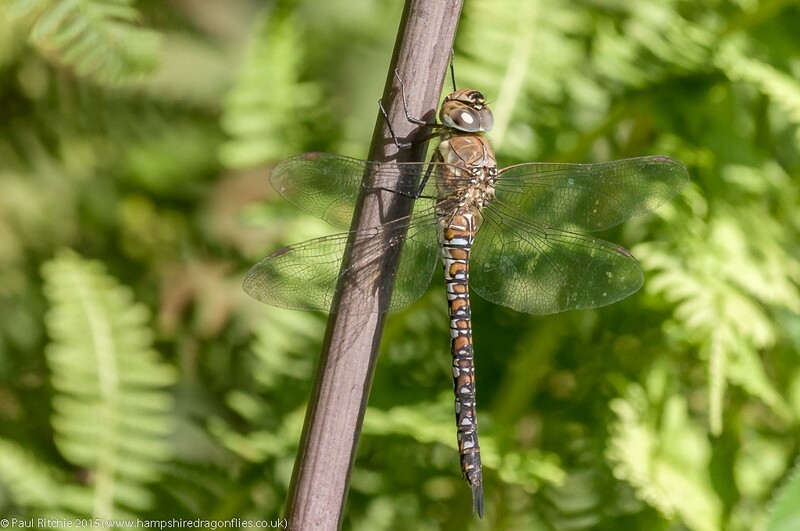 A few wary Common Darters rose with our passing, out-numbered by the fine population of Speckled Wood butterflies. How very apt a name? 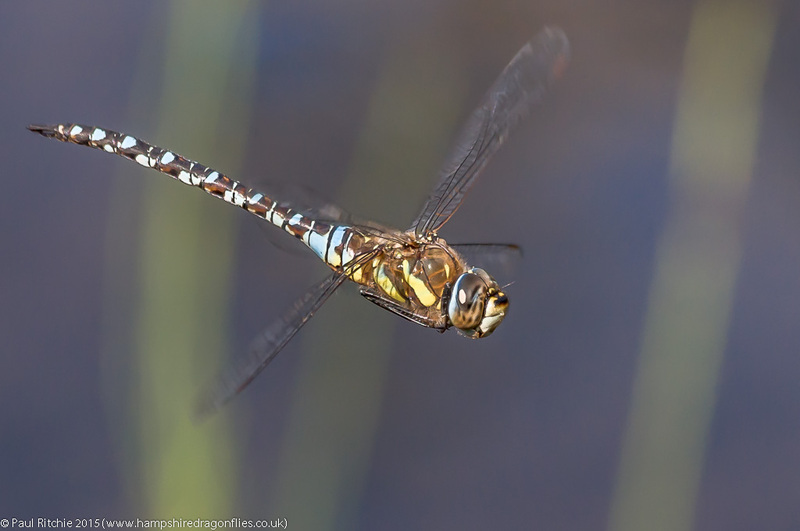 When we finally reached the pond we had a male Brown Hawker patrolling intermittently. Always a challenge to get in flight, but I made an effort anyway. 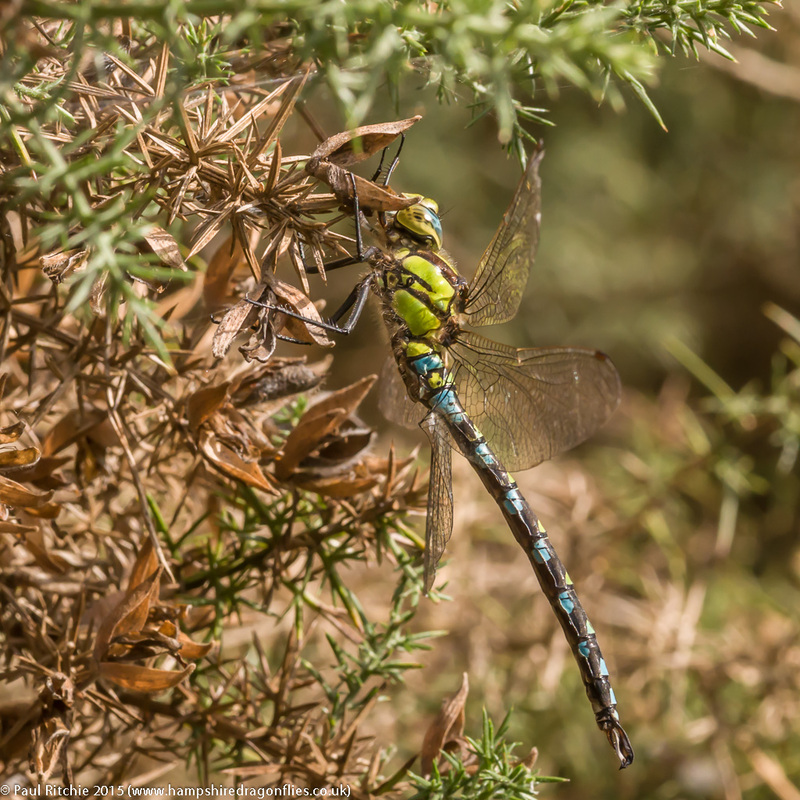 When I first found this pond in Spring I knew this was a perfect place for Migrant Hawkers. 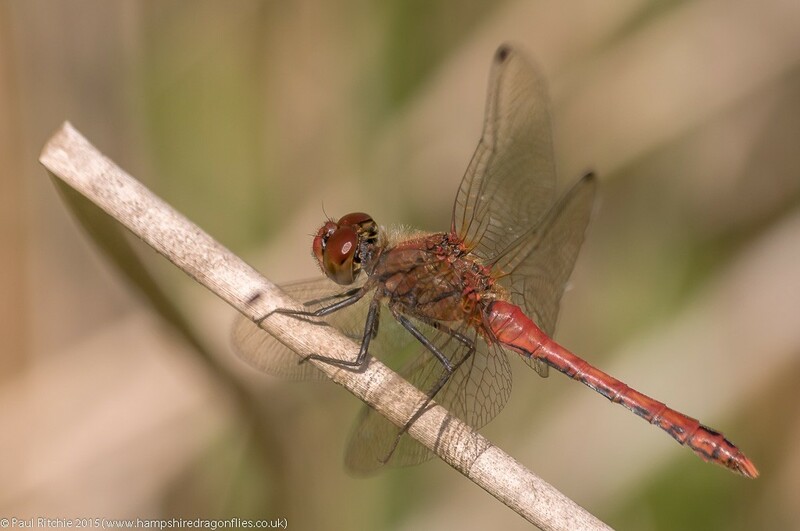 The extensive stands of Bulrush and the presence of Ruddy Darter were a dead give-away. Both were present today, with Migrant winning the count. 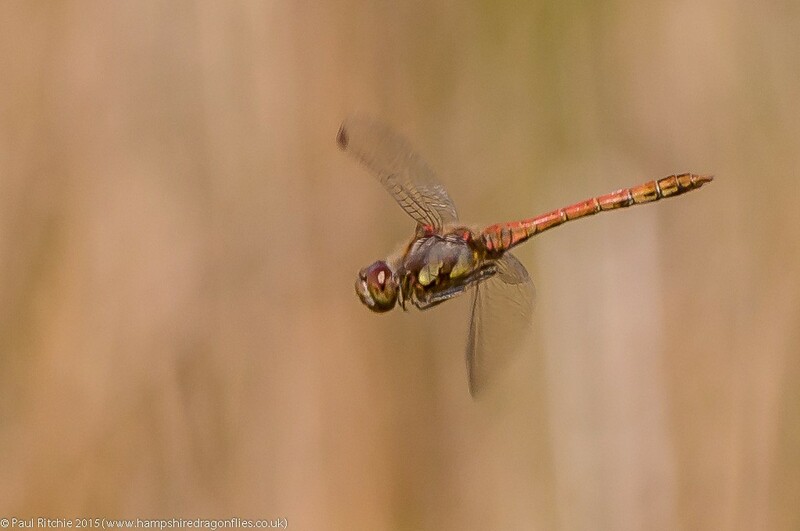 The Ruddy however were scarcer this time around, and even the Common Darters weren’t present in large numbers. 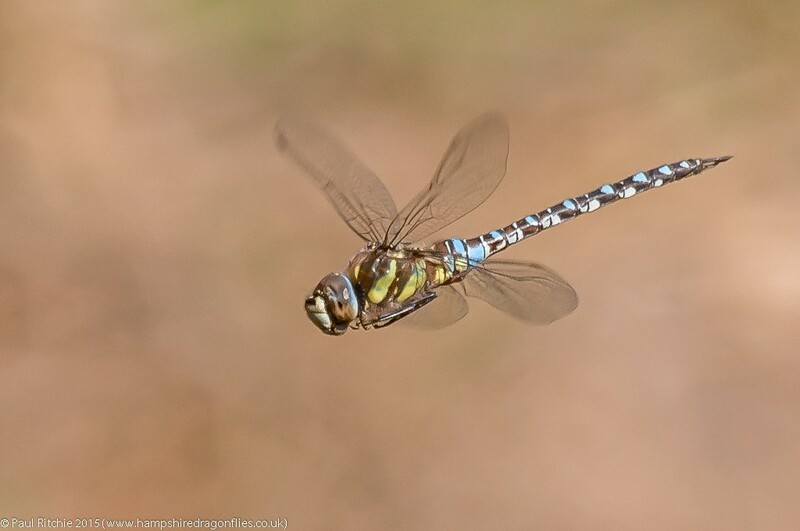 A few Common Emeralds were present but no sign of any other damsels. It was to be a day for the female Southern; at least three present along with three noticeably different males – a good recipe for some pairings. Sure enough, the two pairings we witnessed rose high towards the trees and perched about 20 feet up! I’m beginning to wonder whether that pair I chanced upon 5 years ago was sheer luck! 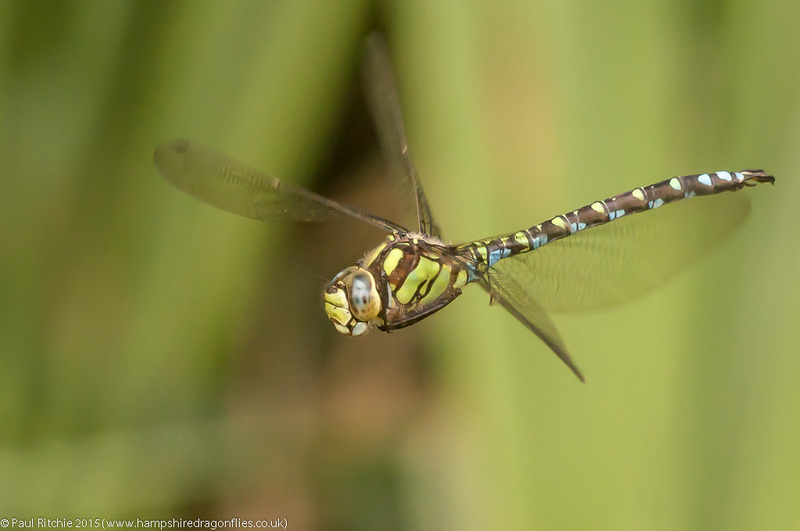 Shortly afterwards my attention was grabbed by another male Brown Hawker. After a brief battle between the males, one of them landed at my feet to carry on feeding on his prey of a Red-legged Shield Bug. One of the male Southerns was sneaking in & out of the under-shore where the female had been, making for some tricky in-flighters. Occasionally he would rise to check me out. 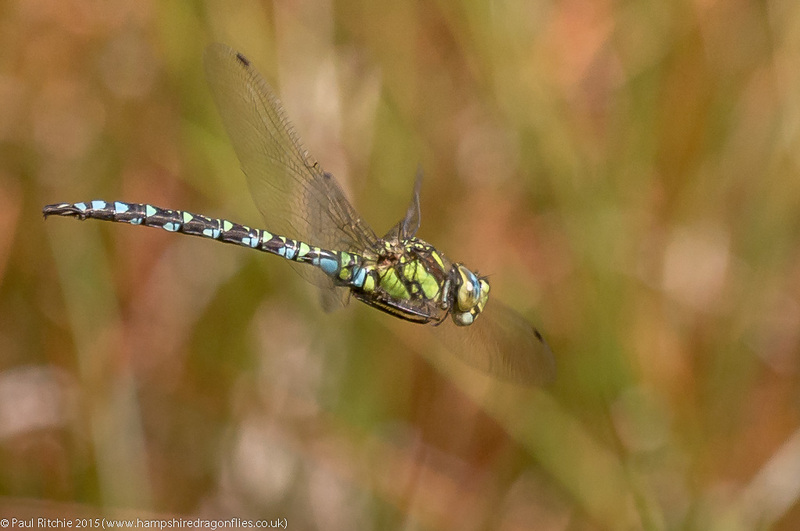 A frantic rustling in the grass alerted me to a female Southern Hawker held fast by her wings in a cobweb. I gently removed her and placed her among the scrub to allow Sue to use her fingernails to clear the web away from her wings. 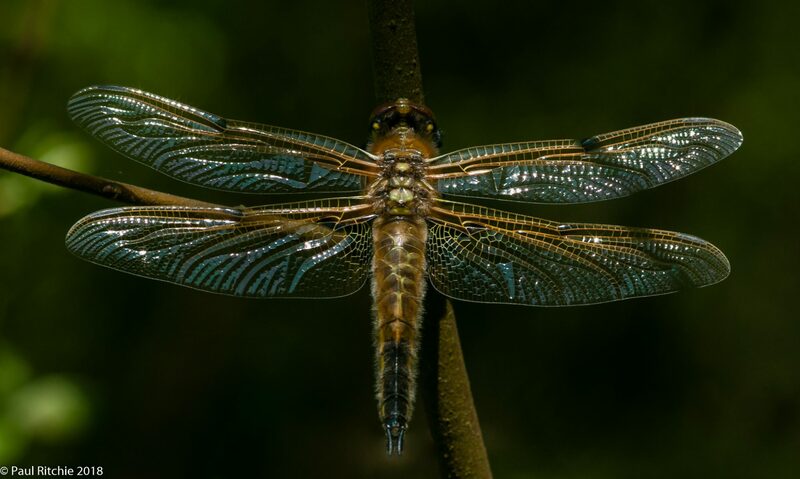 Now there are a few out there who frown upon intervening in nature, but I consider myself part of nature and if I can help a dragonfly, I will. This female doesn’t have long to live and needs to produce a new generation before her time is up. Becoming lunch while she’s ovipositing is unfair and unnecessary in my opinion. So a good day then. Six species and plenty to keep us occupied. Some of you may be aware a certain newspaper (sic) predicted an ‘Indian Summer’ starting this coming weekend. The met office and BBC weather reports appear to have caught up, reporting a swathe of high pressure promising plenty of sunshine with a get-out clause. Temperatures aren’t going to miraculously rise into the mid-twenties. The best we could hope for is perhaps twenty as a maximum provided their is continuous sunshine. With high pressure come colder nights, which means it’ll take a good while for temperatures to rise sufficiently, and if there is a greater ratio of cloud to sun they’ll stall, or even drop. 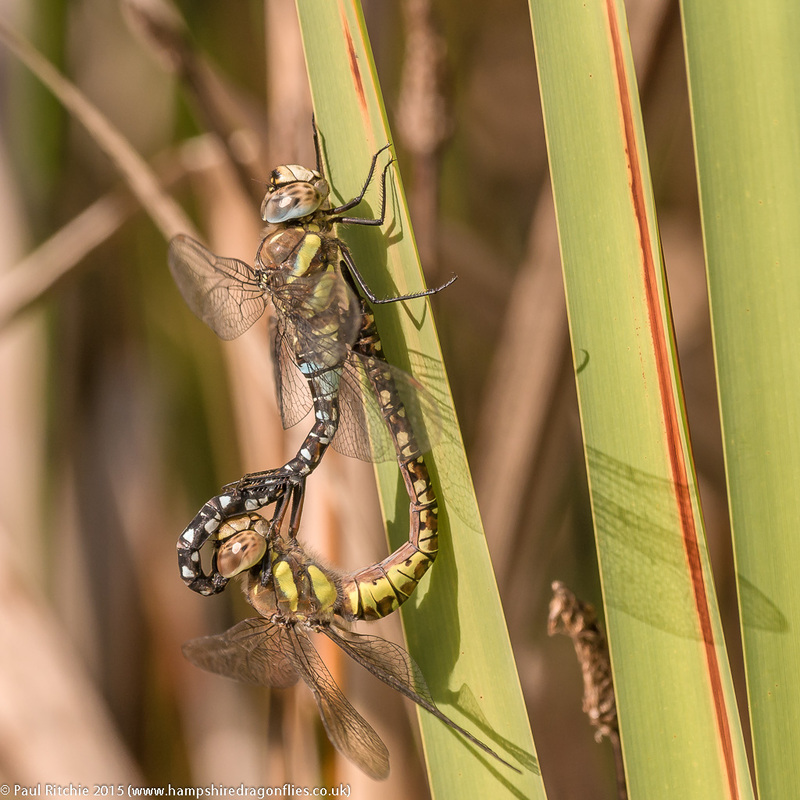 What we shouldn’t expect is a new phase of dragonfly swarms; just the usual suspects encountered late in the season. The best we can hope for is an extension with days at the pond being more satisfying than of late. Just because the sun’s shining outside my window as I write doesn’t mean I’m going to sally forth with delayed enthusiasm. 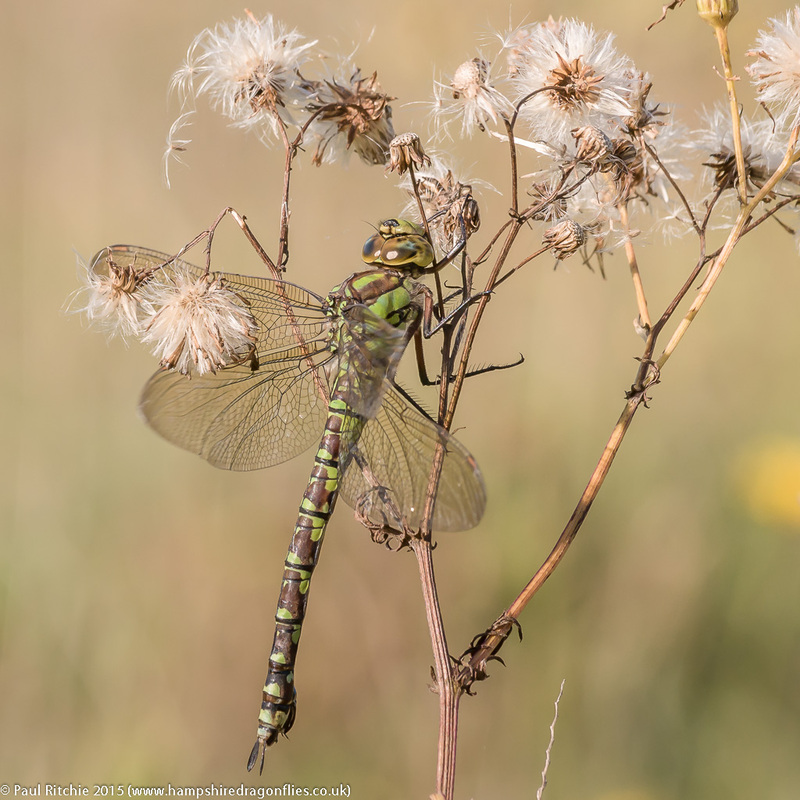 Wednesday was an exception, with enough sunshine throughout the morning to raise the temperatures enough to bring the dragonflies out for a feed before the clouds rolled in. A two hour jaunt around Swanwick Nature reserve before lunch was just enough. The dipping pond is too small for a long wait, but nevertheless provided a male Migrant to start the day. 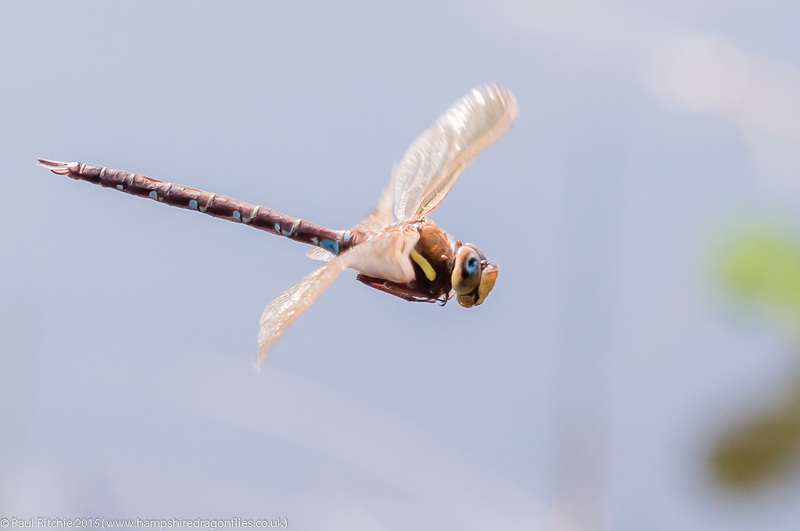 Raised from his rest, he took a few tentative flights around the pond and along the track before returning to perch and warm up. The appearance of another took them off for a dispute far out of reach so I continued around the reserve on my usual route, albeit reversed to experience the fishing lakes later. The cattle have now been introduced to the quadrant which means negotiating piles of waste underfoot. Mixed with saturated ground this isn’t a pleasurable experience, but I persevered to the dog pond at the far end of the reserve catching sight of the odd Common Darter. 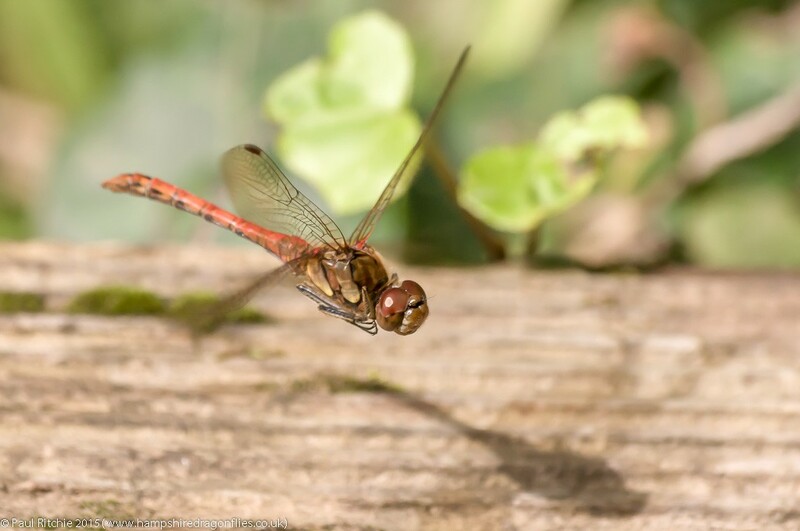 Another spooked Migrant along the path on the way back to the fishing lake where a tussle was going on along the shore between a male Common Darter and a mating pair.Enough to keep me amused for a short while. 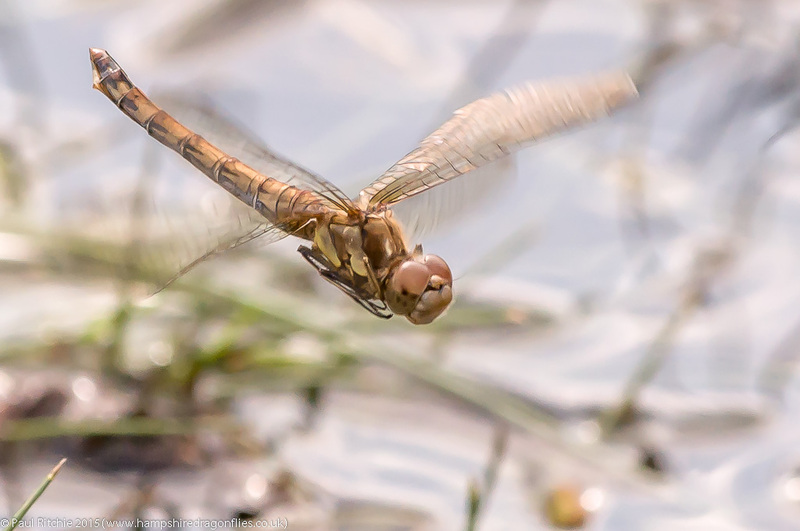 Back at the dipping pond there were a few more Common Darters than earlier and even the odd nervous Ruddy. 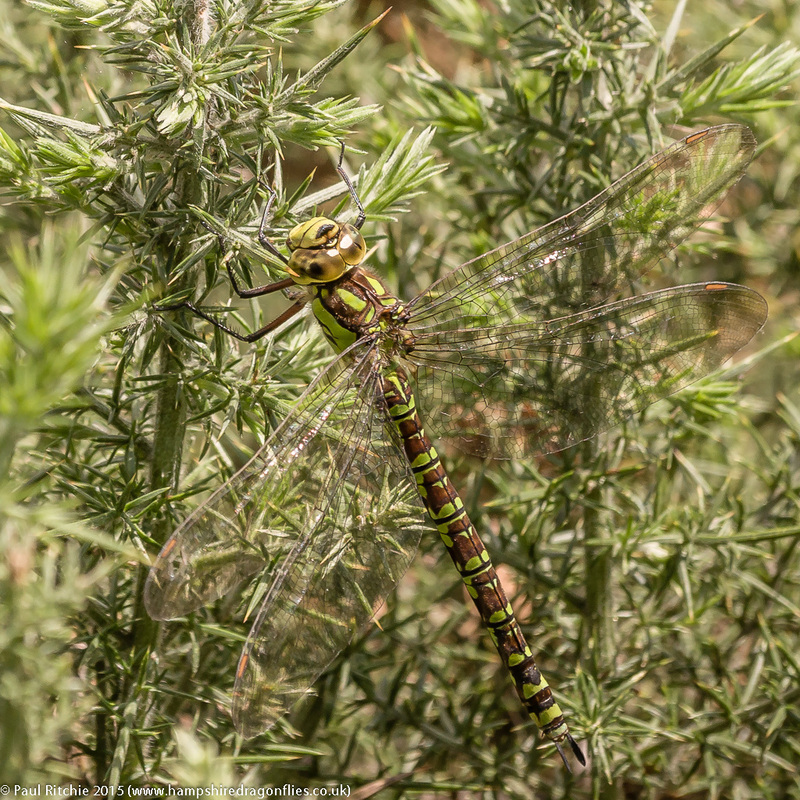 Just as I was contemplating calling it a day a male Southern Hawker took up residence. I couldn’t possibly resist! After all this was the very same pond which began my love of in-flight photography six years ago, almost to the day. At the time it was the only option of getting a shot as he wouldn’t cease patrolling, and little did I know it would lead to my favourite waste of time. 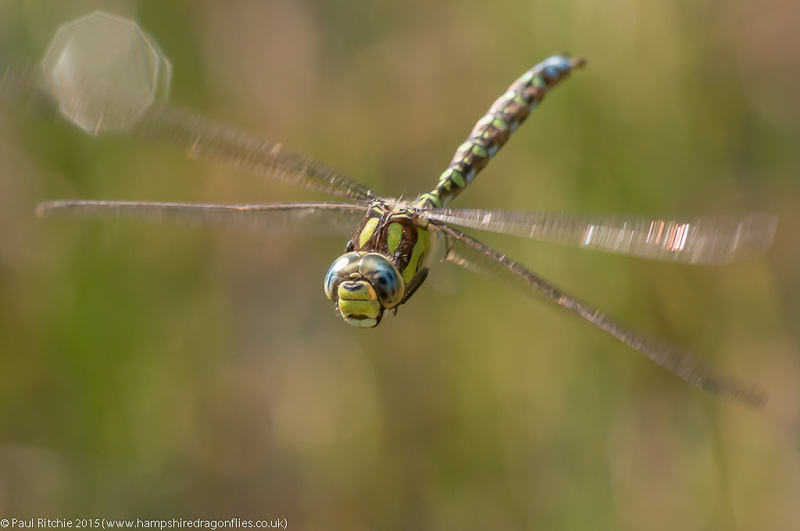 This brief encounter ended up giving me my best Southern Hawker shot of the season. Or should I say so far? On arrival at Bramshill we bumped into Mike; a chap I’ve met on a couple of occasions but not immediately recognised, for which I apologise – it’s hard to remember faces at the best of times, but from the seat of a car can be even more difficult! So hello to you sir! Those responsible for the management of Bramshill Plantation have done a sterling job clearing out the saplings which were threatening to consume the clearing with the ponds. My only criticism is maybe you were a little vigilant removing the gorse stand between the two eastern pools. Still, a vast improvement and I’m sure come next Spring there will be enough new growth to offer refuge. Perhaps because of the recent shearing the usually busy pools were missing their usual activity; just the one Common Darter and one male Migrant along with a scattering of Common Blue and Common Emerald. However that elusive hidden pond had plenty to keep us busy for an hour. Two male Migrant, two male and a female Southern, an Emperor (! 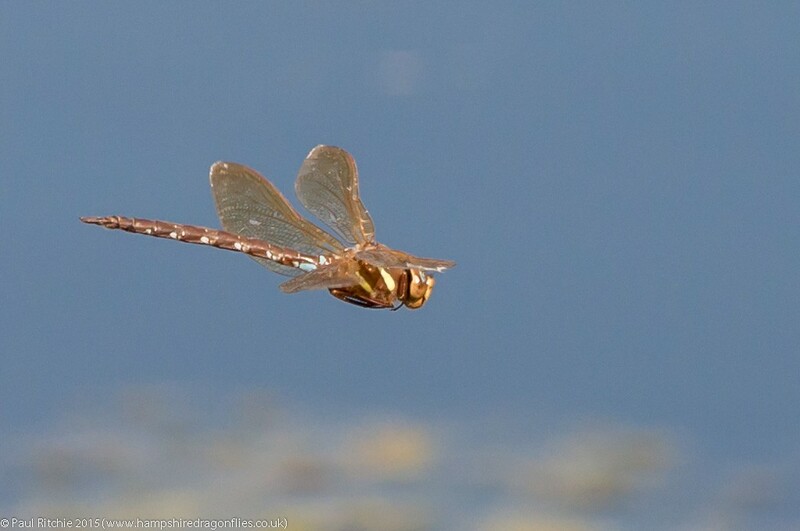 ), several of the former damsels and a fair showing of Ruddy Darter. I spent a good while coaxing one of the Southerns towards the background of moss; against the sun, but worth it. At one point a female Southern flew in and did a circuit before one of the males found her and they frustratingly rose over and above the treeline – something which was to be repeated a little later. 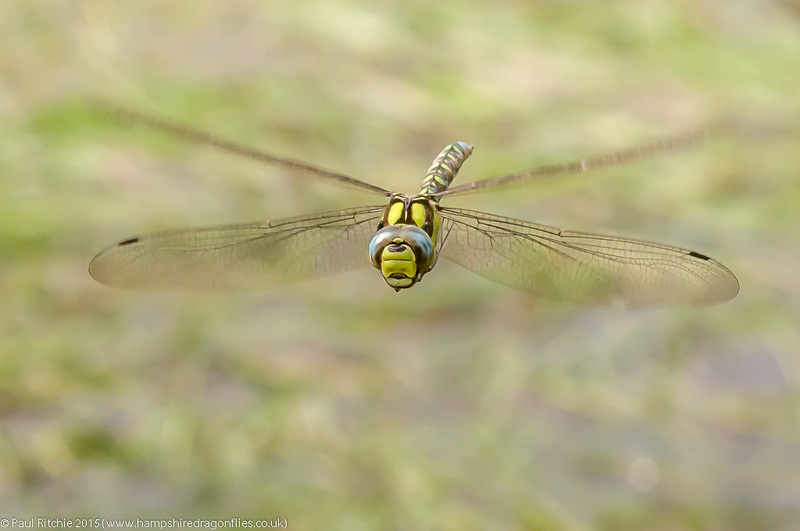 The only large species I had left was a resting male Migrant. The strange perching behaviour of the Migrant. 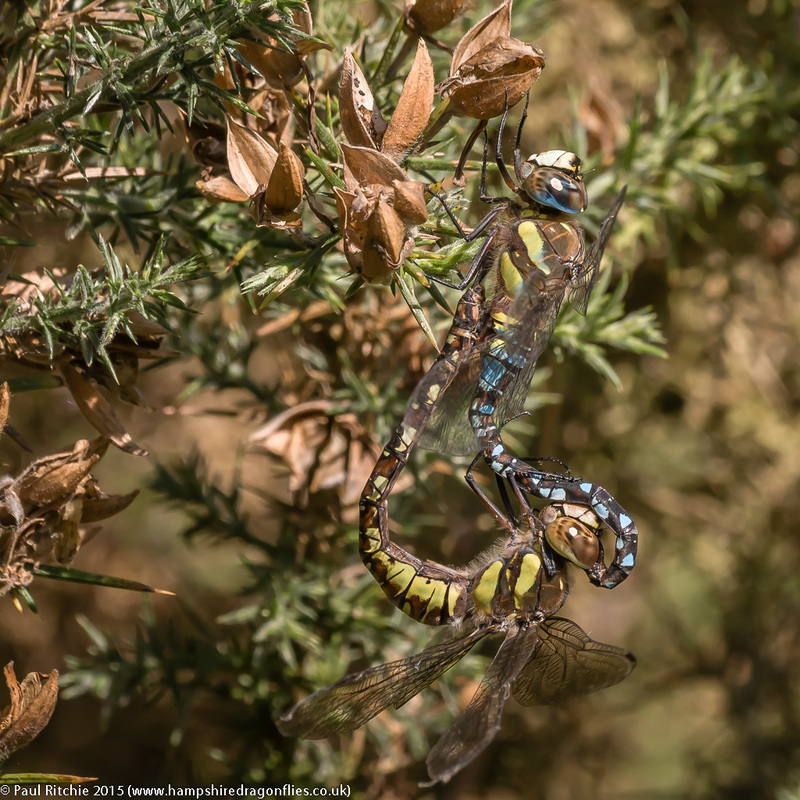 I’ve not see many other hawkers perch this way up except the odd Emperor…oh, and a rather surprised Brown Hawker I surprised last year. I wonder if it’s a size or weight thing? I’d certainly be interested to hear of any other hawker examples? With most of my subjects gone we decided to take a walk along the shores of Long Pond. 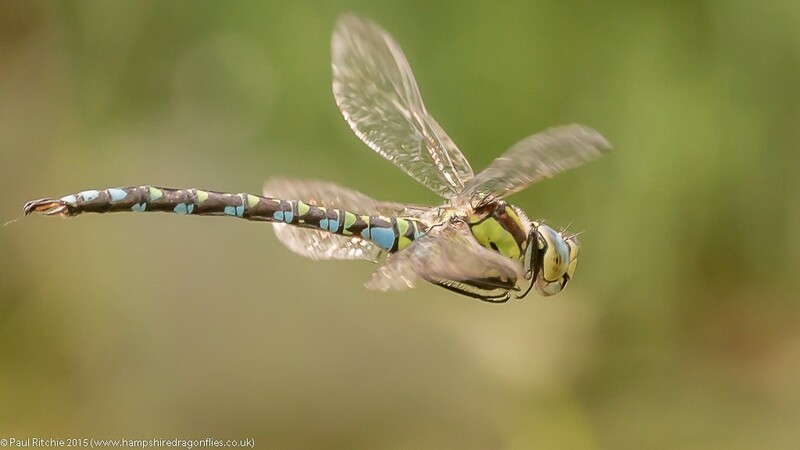 On the way through we disturbed a perched male Southern Hawker who rose and settled close by. As I was choosing a pleasing composition a small, ugly black cloud turned the ride to darkness; dropping the ambient temperature several degrees from which the rest of the afternoon never fully recovered. 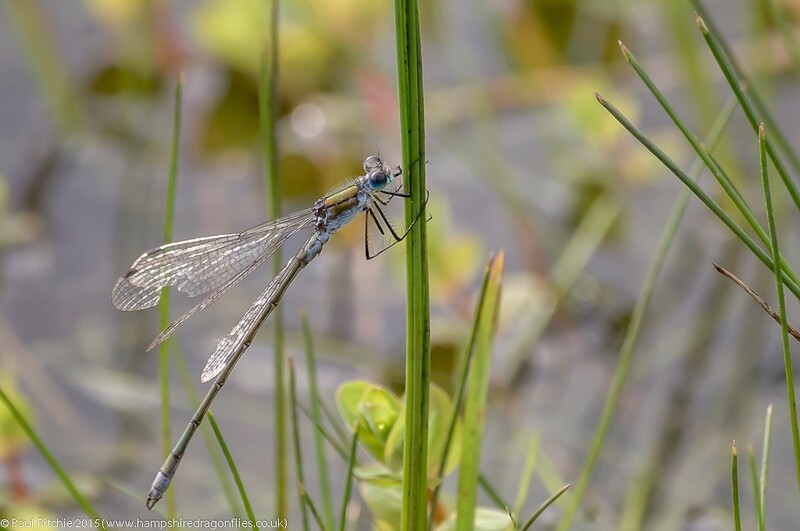 The results were immediately apparent along the north shore of Long Pond, with only a couple of Migrant and a few Common Darters visible along the path. Unsurprisingly the water’s edge was devoid of any action except for a couple of Migrant intermittently sharing the western corner. We decided to return to the ponds only to find they too had all but been deserted; just a female Southern scouring the edge before being whisked away by a male, again right over the treeline. Still a few Ruddy around though. Except for another male Southern along the path, that was it for the day. A successful day though…at least for the first hour. A whole week since I’ve been out; mostly to do with the inclement weather, but partly to do with not wanting to push it. Remember what I said about the first good day after rain? Always a gamble…but I had to get out. Not a blinder by any means…sunny spells…but better than intervals. First call Town Common for a full traverse. 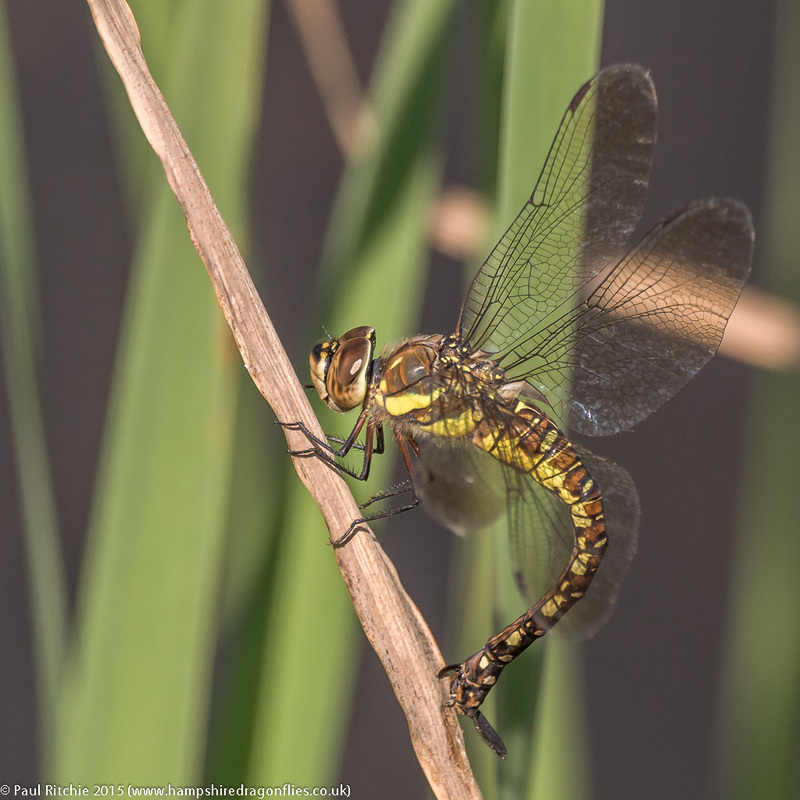 I wanted to know if there were any of the boggy three still on the wing – the Black Darter, Common Emerald and Small Red. Maybe slightly early? Too cool still? Certainly no hawkers to be seen, but surely the cool-tolerant triumvirate should be around in the grasses and heather? Afraid to say, despite my tenacity, I didn’t find one. The rains had turned parts of the path into ephemeral pools, and a working party were busy clearing some sections. As I approached Chris Dresh (the Ranger) came to say hello and give an update on the continuing and prospective improvements to the site. Not a little bothered by the lack of action, more by the encroaching gloom of a black cloud, I wound my way back to the car and hopped the short distance to Ramsdown. I would’ve crossed the A338, but the crossing is out of bounds during the roadworks until next Spring. Nothing at the first pool…nothing in the clearing…at least the hidden pond had a Southern patrolling during the sunnier moments. One of those unpredictable males who wouldn’t offer an easy shot. 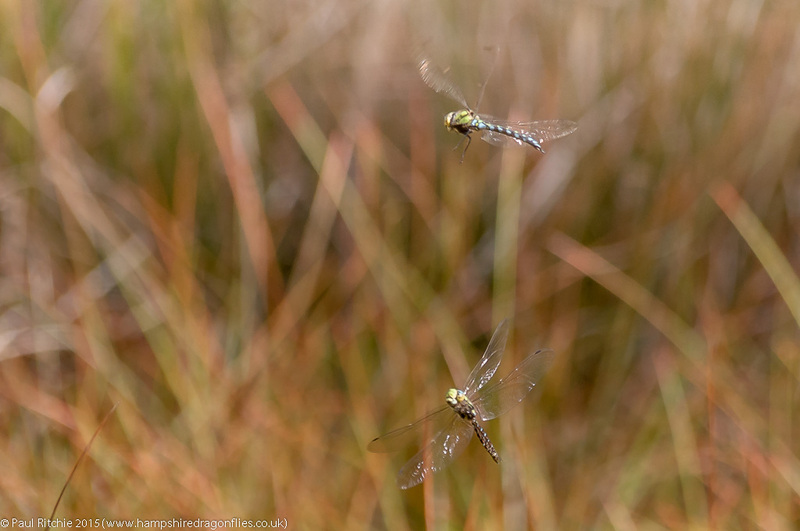 Other than that, a couple of Common Emerald (finally!) and male Common Darters. While the sun hid I climbed the hill to the sunken pond (must find a name…or give it one). The water levels had made it even more difficult to navigate, but at least there was more action. 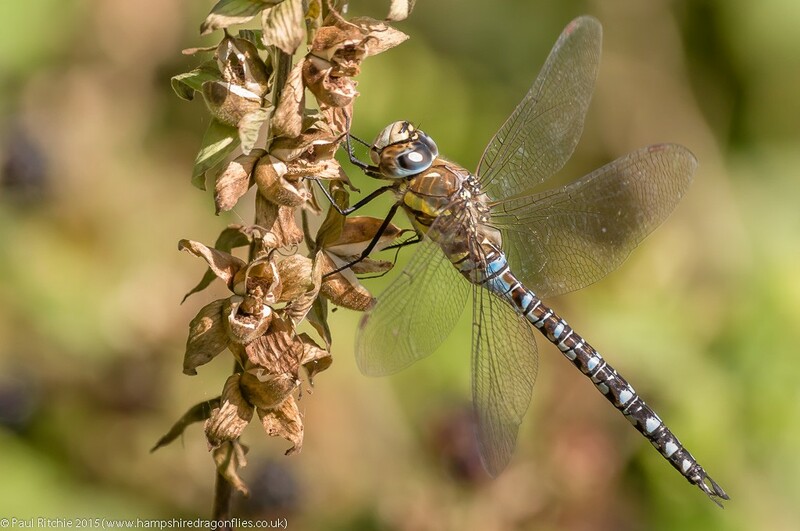 During one sunny spell I even had an old male Emperor hanging on in there – the first I’d seen since Priddy. 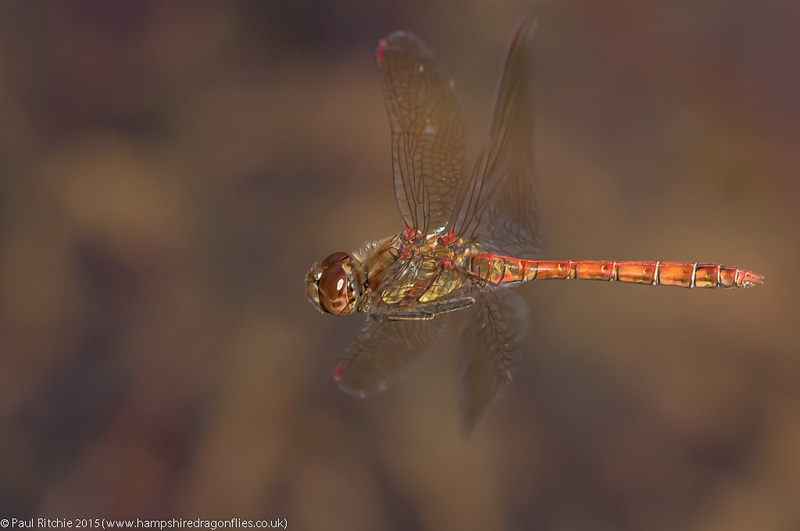 Also present were the inevitable Common Darters, Common Emeralds and a lone Small Red. Unfortunately not available for photos. 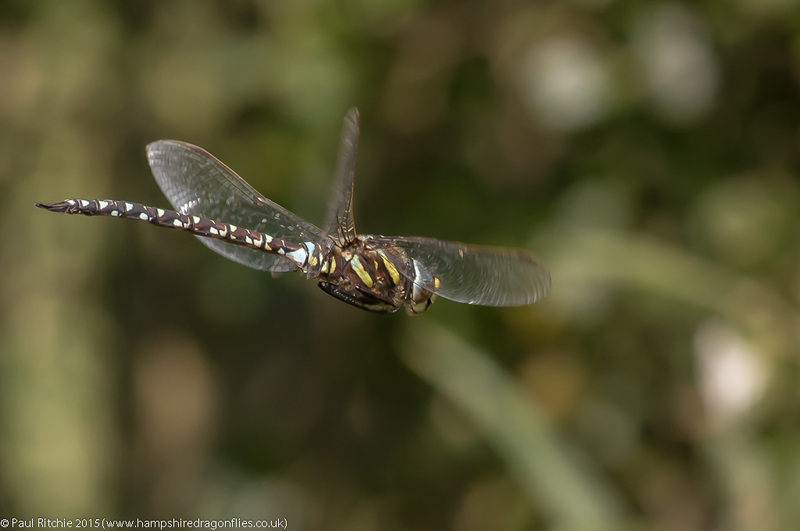 Crossing the heath to the other side I had a Migrant Hawker buzz me for a short while, and down on the mossy bank I finally found a Black Darter. The best shot of the day, and at least an opportunity. After searching through the mosses and reeds for some variety I decided to return to the hidden pool to try for that Southern, if he was still about. He was…and he was joined by an adversary. Really annoying when you’re attempting to grab a shot of one when another comes in for a fight. 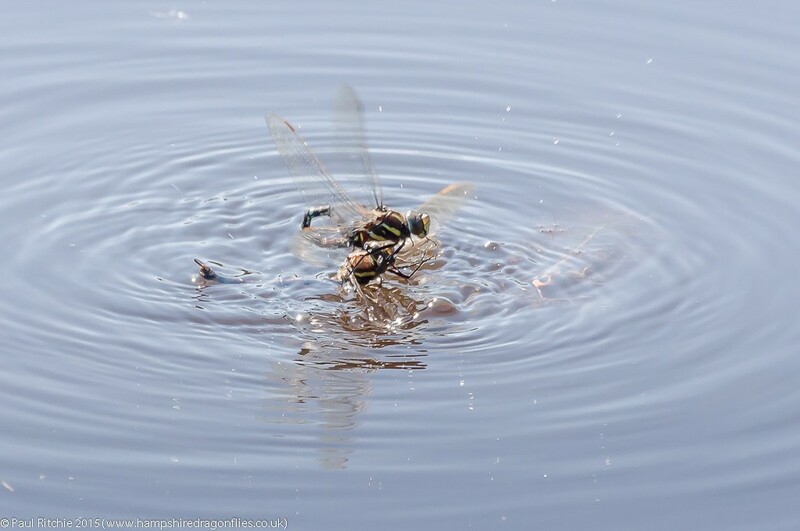 A very small pool this…and very little room for more than one hawker, and after they’d had their little tussle they retreated to their own patrols – one choosing the reeds near the entrance and the other the reeds over to the east. Both too far for satisfaction. And that was it. Disappointing for sure, but not unexpected. Glad to get out though! A pleasant day was reason enough to pay another visit to Bramshill Plantation. I’ve tried to sample the delights at least once a month this year to get a feel of how it fairs throughout the season. Firstly I decided to walk a new path and hopefully come across that hidden pond I found during summer. After veering off the path to battle through some trees, there it was! Still too cool and a little early for action, but a male Ruddy provided the first opportunity of the day. Taking a different route out in the hope of finding an easier way in, I eventually appeared down the ride leading to the other pools. A male Migrant was present at each of the three pools, and a male Southern flew in briefly before disappearing off somewhere to feed. I was anxious to check along the south shore of Long Pond, having been so prolific throughout the summer. Not now though; only a few Common Blue, Common Emerald and Common Darter. No sign of any hawkers. The north side was better with a couple of male Migrant hawking the path and several more Common Darters providing entertainment. Those little sheltered pockets didn’t throw up the expected delights, but at least the north shore had a willing male Migrant patrolling. Surprisingly the other rides, clearings and intersections didn’t have the usual hawkers patrolling, feeding or resting, so I decided the best course of action was to return to the pools. One in particular kept me busy with a pair of Migrant and (I presume by his behaviour) the same male Southern as earlier. The female Migrant was busy trying to keep out of the gaze of the male, carefully choosing ovipositing sites away from his patrol. That infuriating Southern had an attitude to match his unpredictability, picking fights with all he met and proving hard work to capture in-flight but I did manage to sneak up on him when he perched. I soon gave up on him as my gaze was caught by a the Migrants pairing. Usually easy to approach, these two acted more like paired Emperors by lifting up every time I came near. After finally bagging a shot I decided I was going to pin down that pesky Southern. I’ve encountered some very disagreeable Southerns this season. Entirely at odds with their normal inquisitive and gregarious nature. I suppose I should be grateful for the increased challenge. A rustling in the rushes caught my attention and as I approached the female Migrant lifted and perched conveniently in a nearby sapling. 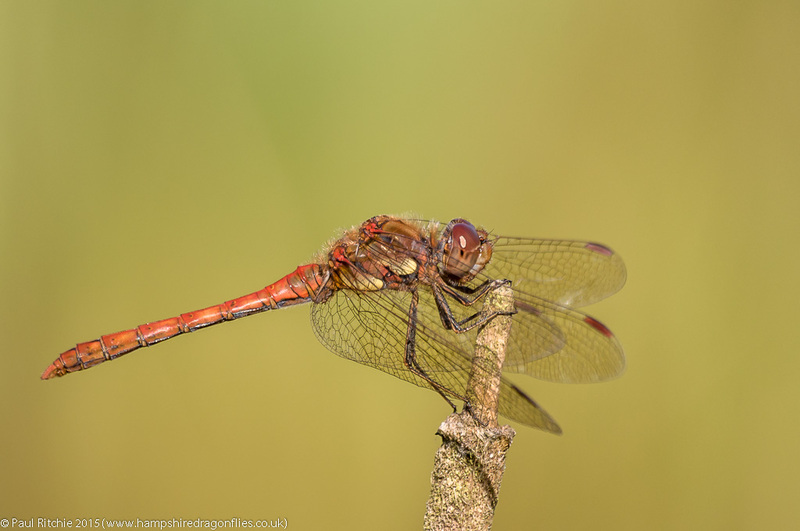 I couldn’t leave without grabbing at least one Common Darter, and this one perched just right. Another pleasant day at Bramshill; firmly established on my seasonal schedule and maybe another chance to experience it’s splendours before I call time on 2015. I get a little trepidacious this time of year; the shorter days and colder mornings mean ever diminishing returns with once bountiful water bodies lacking the excitement of only a month ago. This is so much more noticeable in September when pond-watching can test the patience of even the most tenacious of us. Indeed it is the forest rides and clearings which offer the best pickings in hawker season. One little path I’m very fond of at Town Common hasn’t produced many hawkers this season, so I was very pleased to find a warming Southern perched among the gorse on Tuesday. 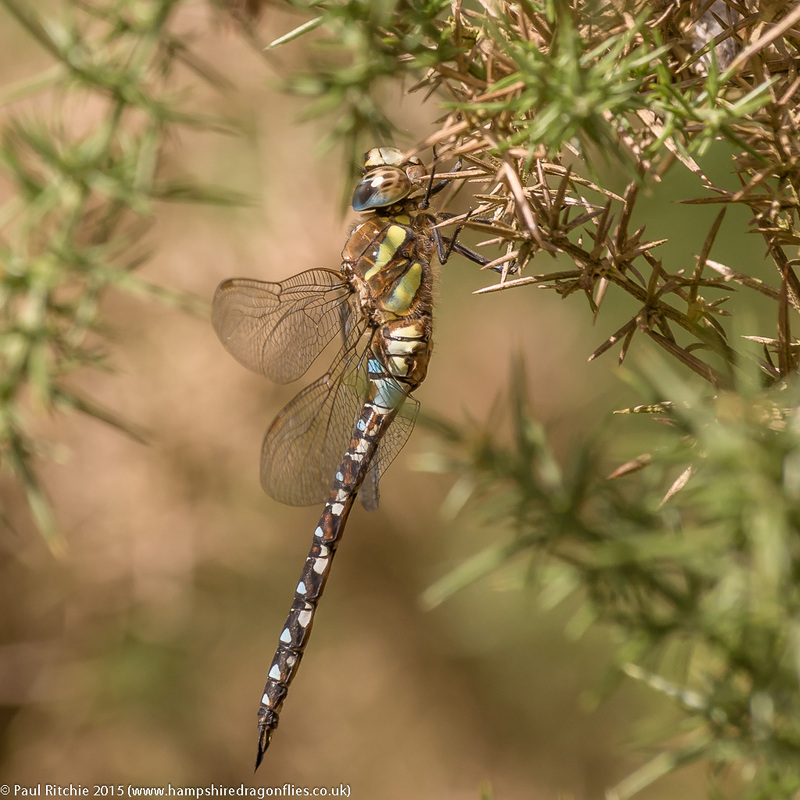 Over on Ramsdown the heath pond had a few Black Darters and Common Emeralds as expected, but still a little cool to bring out anything larger. 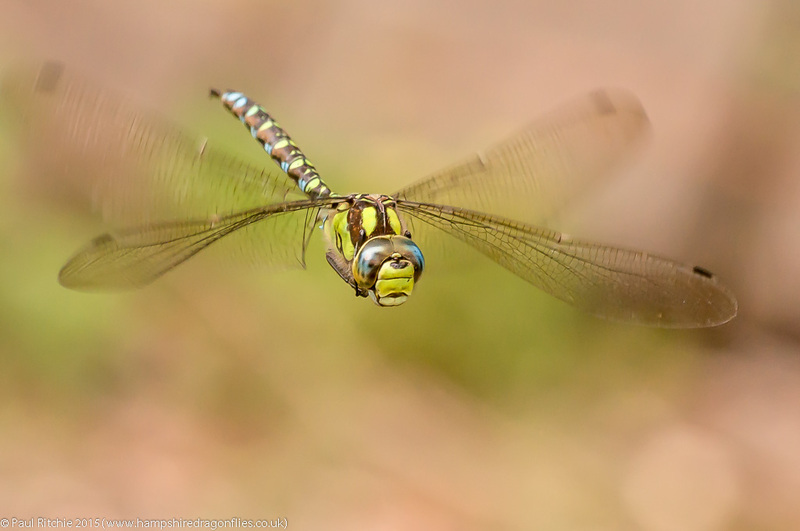 The clearing produced a few Migrant Hawkers though, with a young male giving me a furtive chase before he settled down. 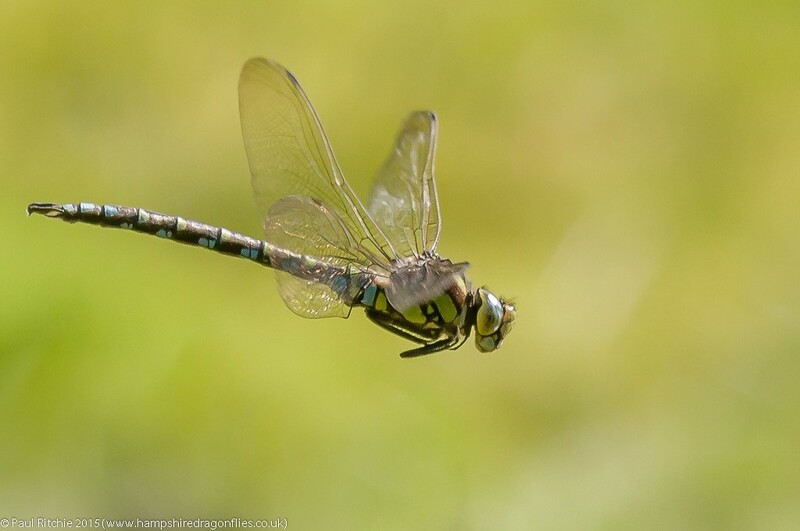 At the hidden pond more Black Darters and Common Emeralds were joined by a few Common Darters. I had to wait a while before a hawker showed up. I was hoping for a Moorland, but a Southern will do. I had two males jostle for supremacy during my stay. The victor selfishly decided the whole pond was his, giving me some exercise chasing him around the pond to determine which patrol he preferred. I don’t know what it is about Southerns recently, but I’ve encountered some tricky individuals, reminding me that you should never become complacent. 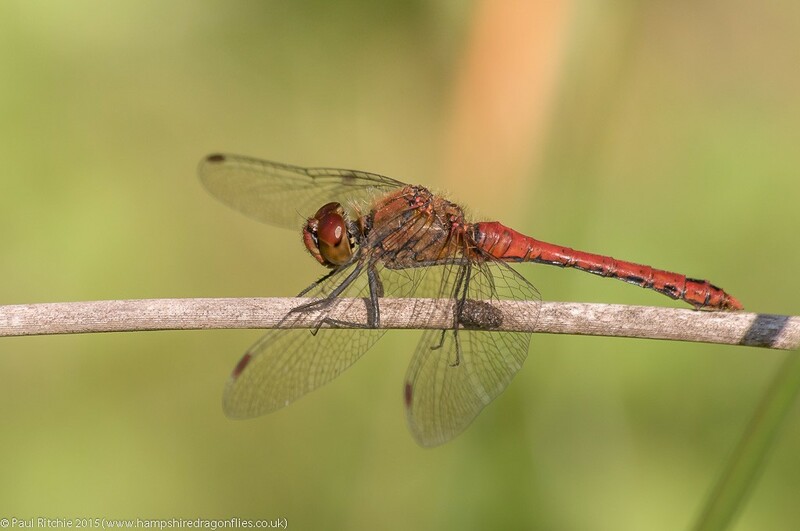 After I had my fill I returned to the clearing and disturbed a few more Migrants with my passing but nowhere near the numbers expected, so I walked across the heath, checked out another couple of ponds and decided to call it a day when a cheeky Common Darter flew up in front of me. You have to give them their due. 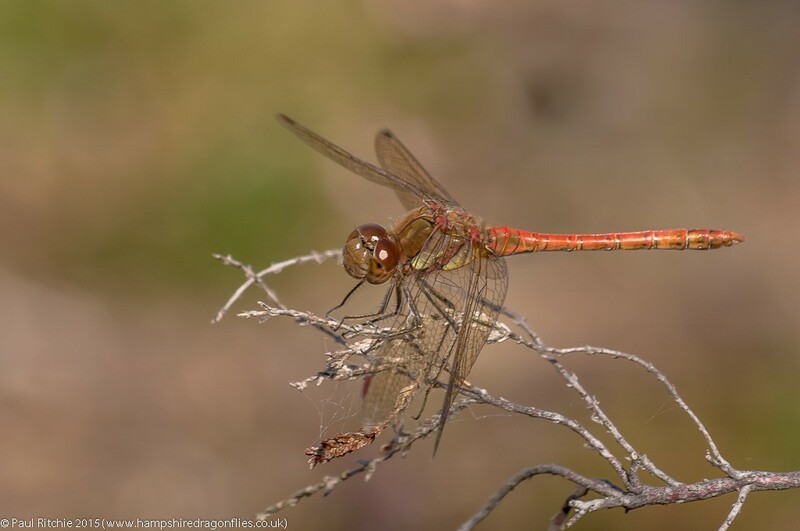 Despite being everywhere most years, this season has seen a decline in numbers with some species – the Common Darter among them – so we should celebrate their presence as a reminder that the season isn’t over yet. As far as I’m aware most of us were blessed with a beautiful day on Sunday. The first decent day for a fortnight and our whole journey there (and back) to Priddy was a pleasure under such blue skies. We arrived just after 10.00am to the sight of a couple of white clouds bubbling up which bothered us a little, but we needn’t have worried. Our first surprise of the day came in the forms of Steve Covey and Damian Pinguey. Great minds obviously think alike. Slightly later we were joined by Mike (Dimery) and Jerry (Hawker) caught up with us early afternoon. Good company can lift the soul and provide diversion during the quieter moments, as, perhaps not unexpectedly, activity was way down on last year. 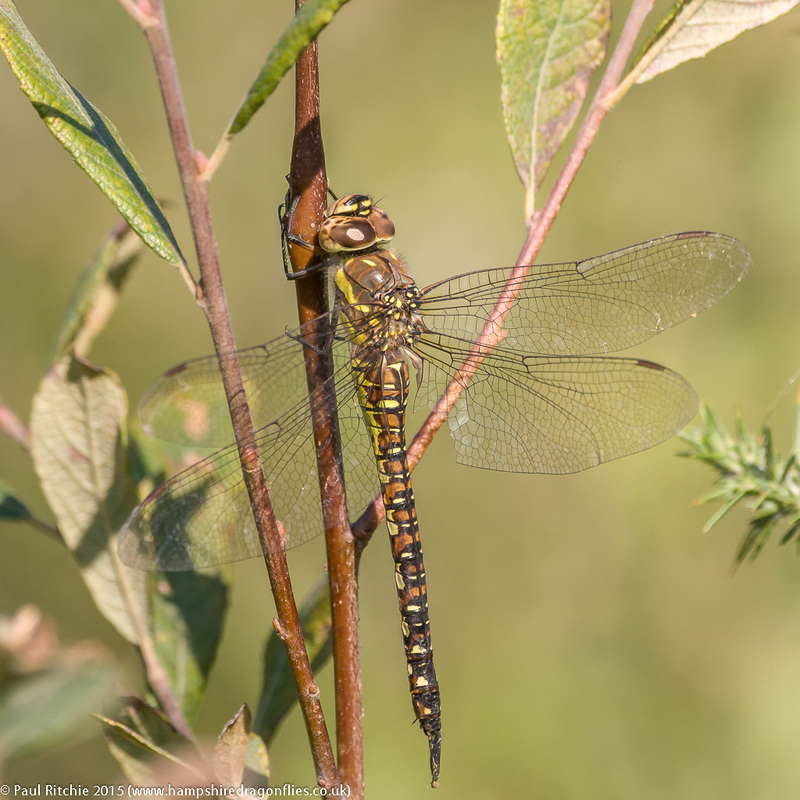 There were only a couple of Moorland Hawkers around the boggy section, including a predictably nervous female, and the odd one or two around the margins, so I decided to remain near the entrance which proved to be key on our last visit. Again only two or three males intermittently and the occasional female, neither of which offered a predictable opportunity. The best I could manage today involved a concealing wing! 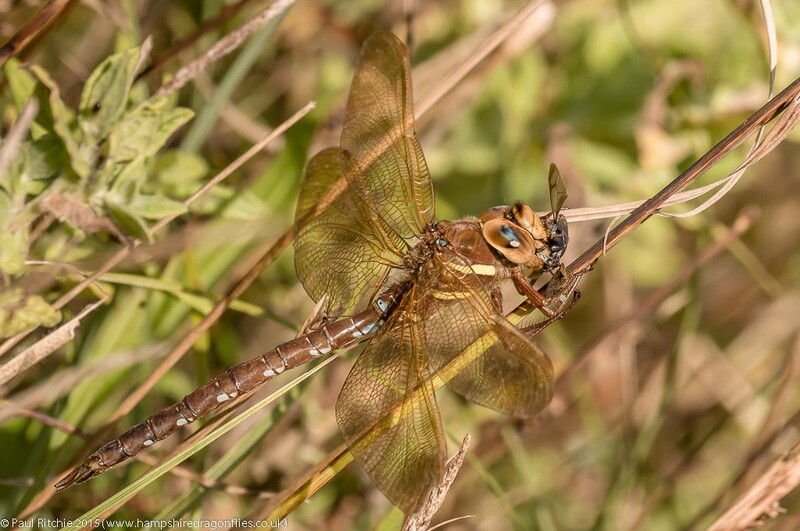 The appearance of a Brown Hawker caught my attention finally giving me a chance to engage with a patrolling male who wasn’t half a mile away. Unusually he kept an almost predictable path, but still proved to be a very real challenge. 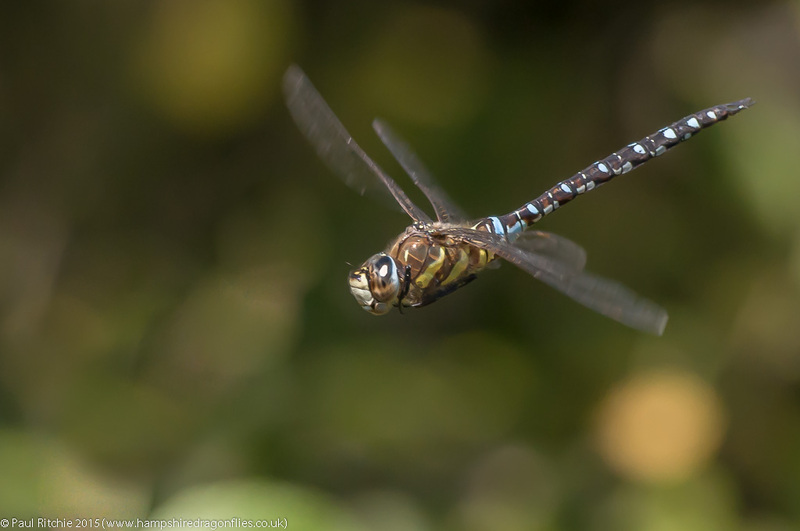 The Migrant Hawker on the other hand is always an easier subject with their tendency to hover in one place, even it that one place is just in front of the trees. 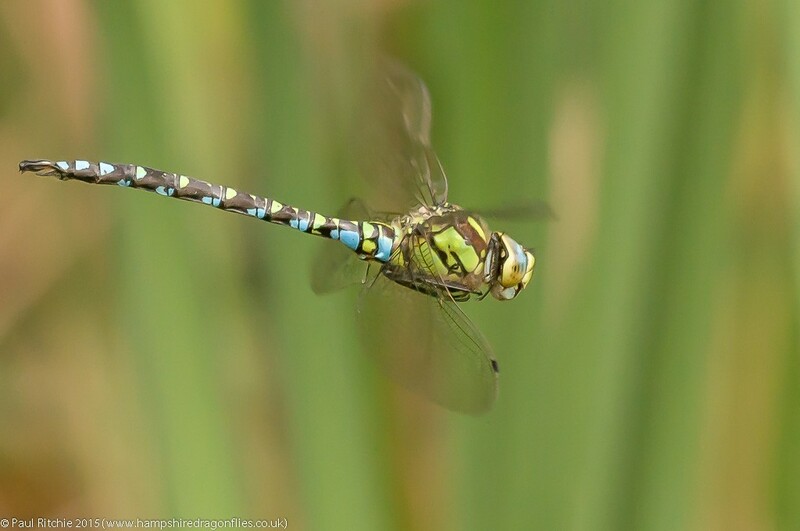 Around the same thicket a male Southern Hawker chose a more terrestrial path, foregoing the open water by choosing the main path and the small stand of Bulrushes. 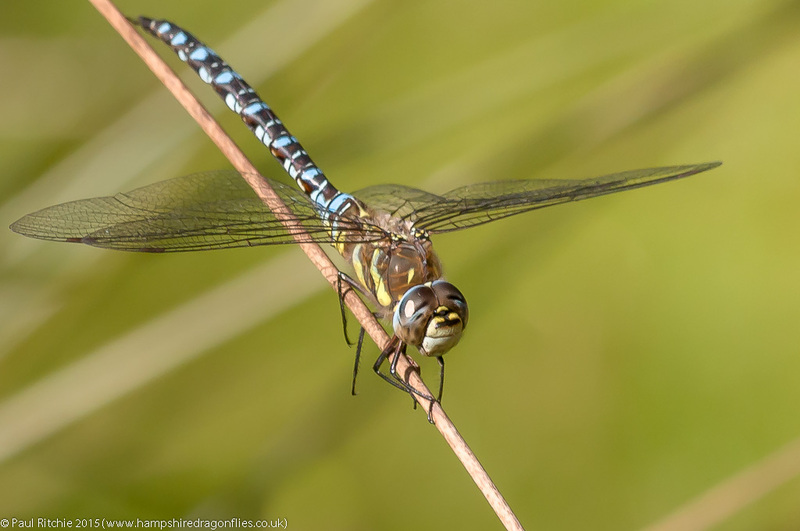 Common, Ruddy and Black Darters were available for those who wished to seek them out, while damsels were represented by a few Azure, Common Blue and several Common Emeralds. Despite the prolonged sunshine activity over water became rather muted during the afternoon giving a chance to explore and seek out any perched individuals, but I preferred to observe from the shoreline in case any more action was forthcoming, allowing those rare moments such as a coupling being instigated. They successfully paired and disappeared across the treeline with Steve and Damian in pursuit, but given the terrain and distance it was better to allow them their privacy on this occasion. Friends with a common interest swapping tales & techniques and the unexpected chance to get all four hawkers one day, but this time in-flight. That’s a good dragonfly day! I read an interesting article on the concept of ‘luck’ recently where, among other things, it concluded luck is predetermined by your choices – essentially lucky people create their own luck by being in the right place at the right time. 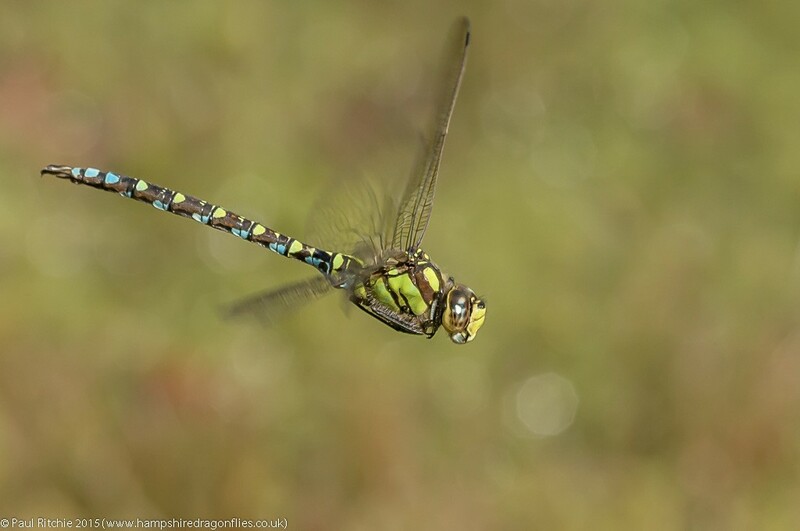 Our grim weather systems recently have resulted in very few dragonfly-friendly days. 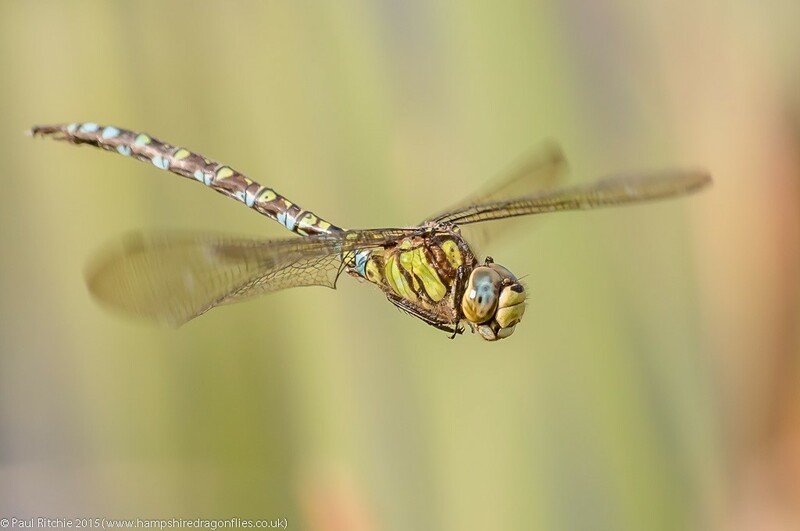 I’m not a gambling man by nature, but I will take a punt where dragonflies are concerned. 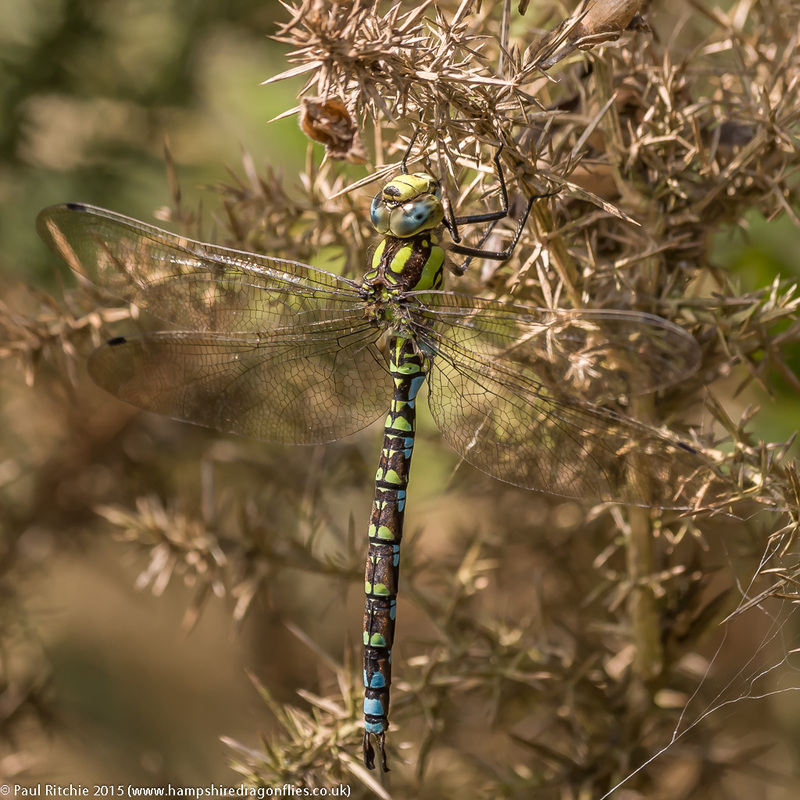 On a bleak Thursday afternoon Sue & I took a stroll around Swanwick Lakes Nature Reserve just in case, and were rewarded with sightings of three Southern, one Migrant, one Emperor, a couple of Common Darter and a few Common Blue damsels. 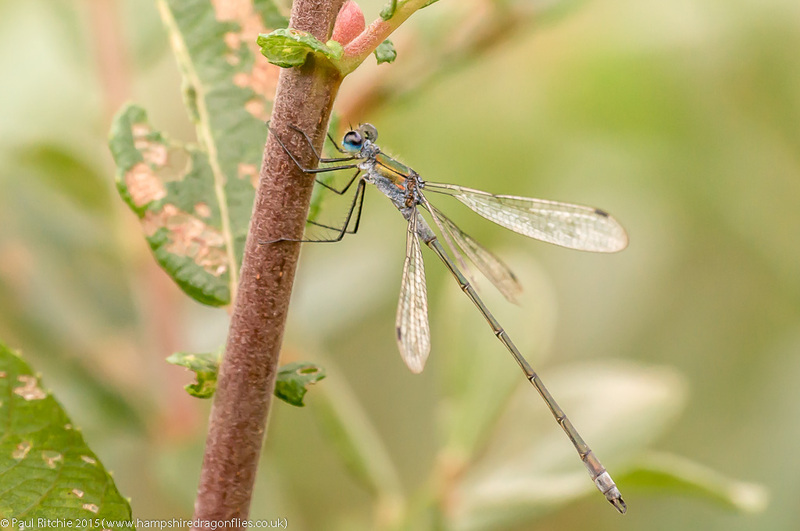 Not a lot and no photo opportunities, but proof that even on a dull day you can get a dragonfly fix if you put the effort in. 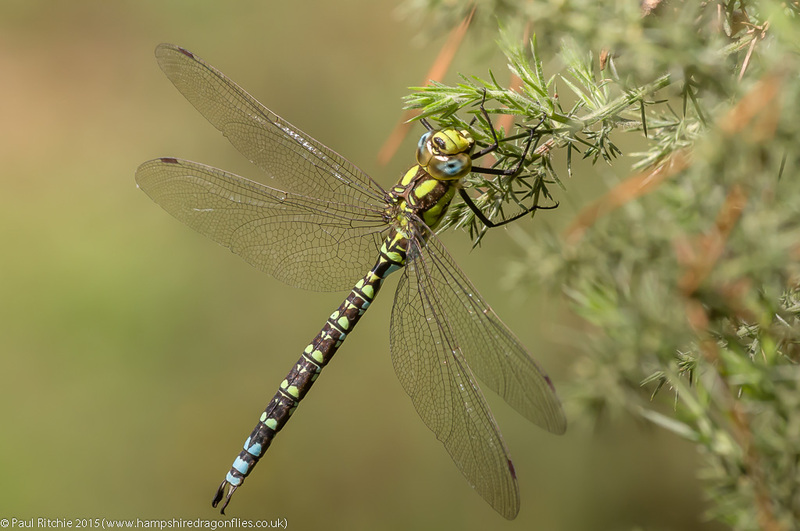 Friday wasn’t much better, but we did have fifteen minutes of sunshine to start the day at Bramshill Plantation, enough to tempt a female Brown, a male Migrant, some Common Darters and a few Common Emerald & Common Blue to take to the water. While this was going on I was busy with a female Southern, roused from her perch by my passing. She didn’t go far, and at first investigated me at close quarters by hovering less than a foot from my face before she perched nearby in a gorse bush. 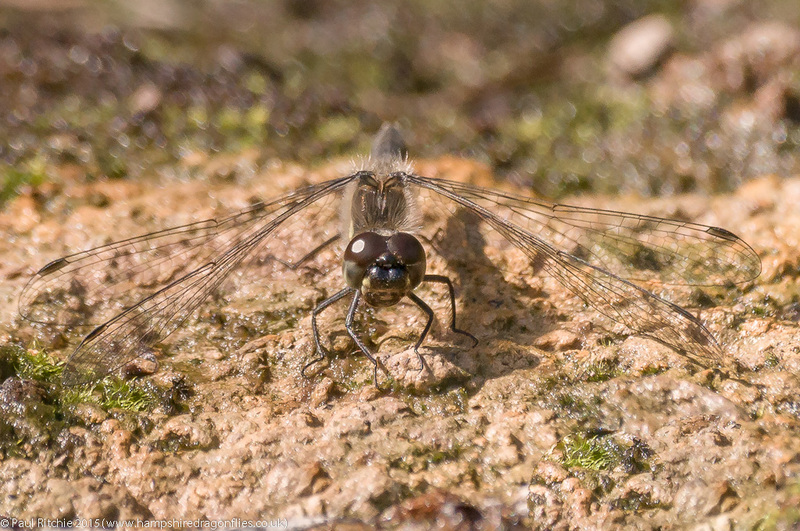 After I grabbed a shot, she moved down to the water’s edge and proceeded to test for ovipositing sites around the margins. That all-to-brief window of sunlight provided the only real activity of the day and with no other breaks in the cloud we took a walk around the plantation for any further signs, but excepting a male Migrant hawking one ride all we had were Common Blue and Common Emerald down in the undergrowth. We took another punt on Saturday, this time locally at Cadnam Common. 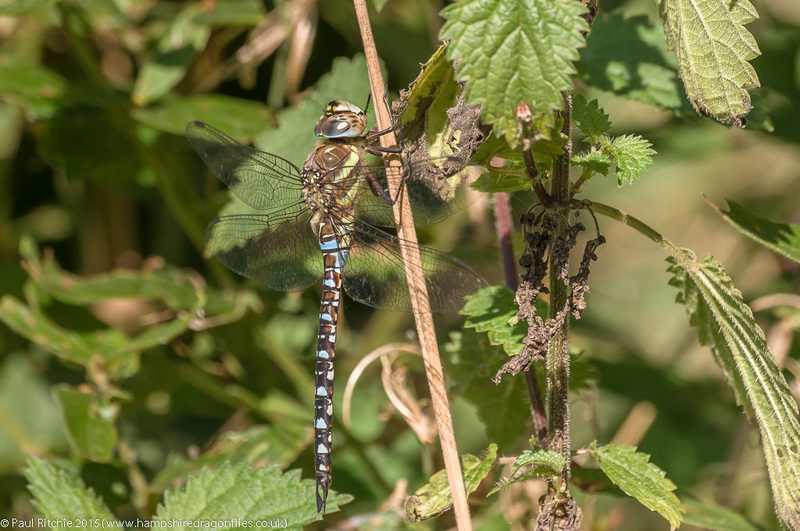 Still that heavy cloud presence and the briefest windows of blue sky to tempt out Common Emerald, Blue-tailed and Small Red, a few Common Darters, a male Emperor and thankfully a male Southern Hawker – the same individual from last Wednesday. His presence was all too brief, as was our sunny spell. Once again we had to amuse ourselves sky-watching, searching the gorse thicket or looking desperately across the water for any signs of life. At least these dull moments makes you look a little closer, Certainly better for observation than photography. We all suffer those irritants so I won’t bore you (or myself) with the finer details; the crux of the matter being without transport for ten long and fraught days. Not that it should’ve mattered, as we didn’t really have the weather for it. Suffice to say it took a while to get back in my stride when I finally did get mobile. I thought a day at Ramsdown should clear the funk, but, as usual after a period of dismal weather, it takes more than one dry day to get back up to speed. I must’ve disturbed (as opposed to flushed) three or four Brown, a couple of Migrants and a Southern from their resting places within the clearing, and as they didn’t reappear I headed straight for the pond. 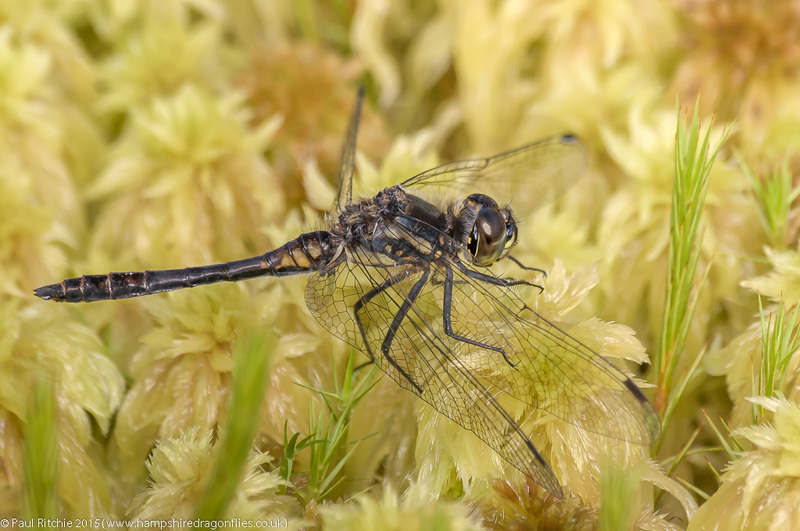 A few Common and the Black Darters joining the Emeralds, but at least an early showing of a male Southern patrolling. As per normal the sun couldn’t stay around long enough to initiate continued play, but the Black Darters kept me amused. I took a stroll over to the other ponds, where at least a male Moorland was contemplating a territory. Preferring to fly over the heather rather than the water, a dastardly tactic which made him difficult enough to pick out with the eyes, let alone a viewfinder. Doug joined me soon after and we popped into Troublefield where at least a few Migrant were providing some opportunities. The meadows are unsurprisingly soggy after the recent rains, the north meadow in particular a mire of diluted cattle excrement; a far cry from the blooming bounty earlier in the season. Still, the hawkers don’t seem to mind. This continued meteorological uncertainty doesn’t warrant travelling too far, so I called in at Cadnam Common. 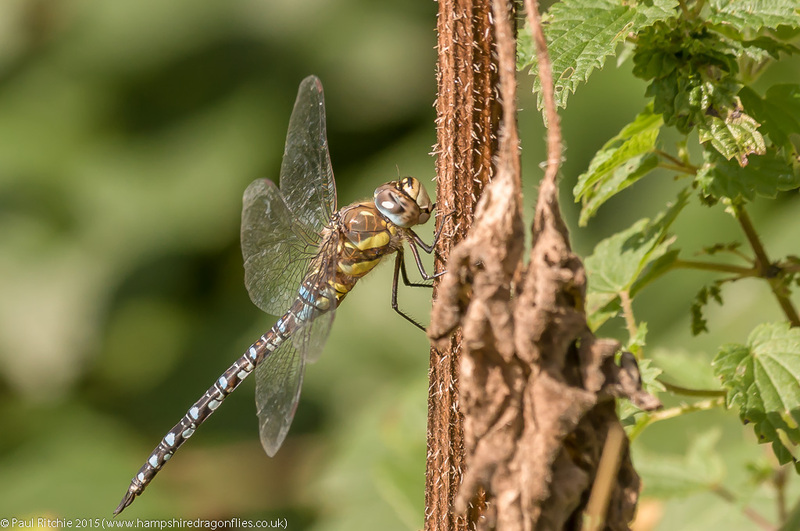 The ephemeral pool hidden in the ferns had a few Common Darter and an Emperor patrolling, and the distinctive in & out of the reeds behaviour of a Migrant provided the first hawker on the main pond. He didn’t last long, being swiftly bullied off by the local Emperor. His pond…or at least this section of it. He followed a haphazard path, occasionally rising up to see off another or get a tad confused by attempting to lock on to a passing female Moorland. 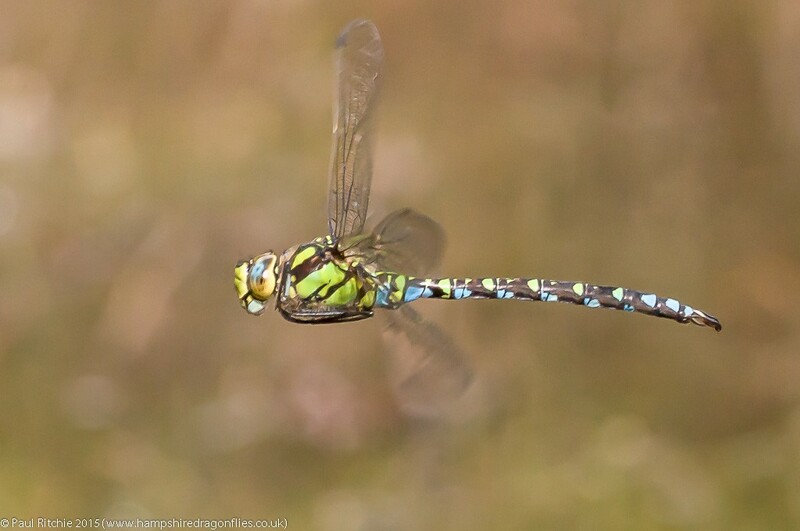 The Emeralds and Darters carried on regardless. Over on gorse corner a Southern finally appeared for a short while in the last remaining rays of sunlight before the gloom enveloped the valley. I found myself cloud-watching. I swear an evil presence was boiling and simmering in a stew of malcontent, slowly and purposely erasing every remaining glimmer of activity. 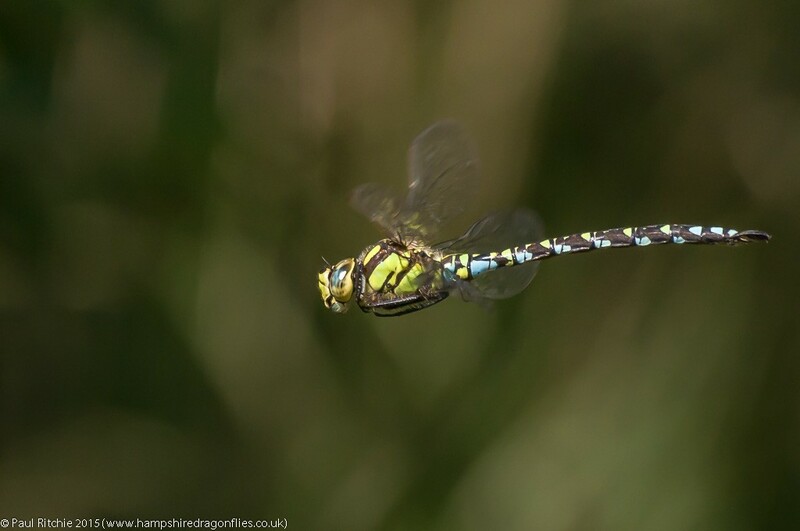 Under these darkening skies a movement across the water caught my attention as a tandem pair of Common Emerald looked for a suitable ovipositing site. What happened next was something I’ve read about, but not seen. The male supported the female while she retreated under water to lay her eggs in the grass stem. 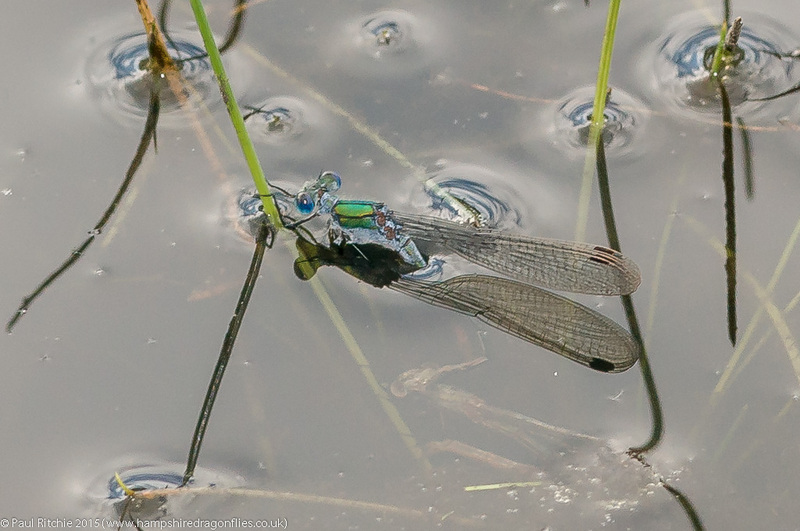 Common Emerald Damselflies – tandem pair ovipositing. A fine sight to round off the day.